At the new Madcapra sandwich stand in L.A.’s Grand Central Market, chefs Sara Kramer and Sarah Hymanson serve four vegetarian sandwiches each day. Here, Kramer shares their best ideas for veggie sandwich fillings. 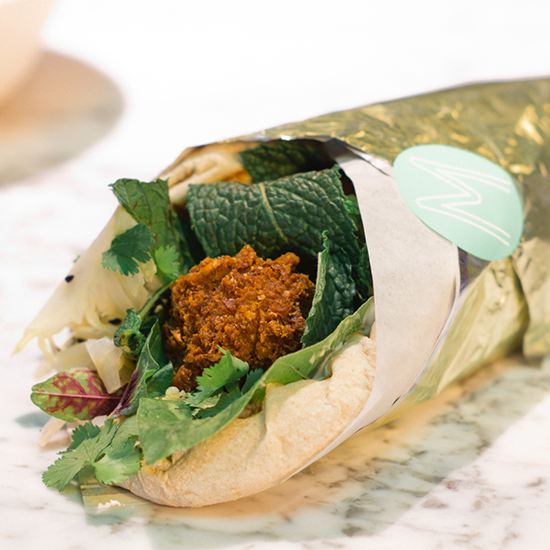 At the new Madcapra sandwich stand in L.A.’s Grand Central Market, chefs Sara Kramer and Sarah Hymanson serve four vegetarian sandwiches each day: two with falafel, two with vegetables or egg. Here, Kramer shares their secret weapons. "After a quick blanch, the stemmy leaves around the cauliflower head can be used wherever other hearty greens like kale would go. Delicious and also economical—they’d otherwise go to waste." "We puree sunflower seeds to make rich, creamy spreads instead of tahini." "It’s a tangy mango pickle used across the Middle East. We make ours with fruits we can find locally, like plums and strawberries (either ripe or unripe). A little goes a long way." $13; noonasamba.com. "A tart Middle Eastern fruit. We use the dried berries on a soft-boiled-egg sandwich with white beans and spiced summer squash." "We spike ours with dried herbs, mushrooms and citrus peel."